Beaulieu Vineyard (BV) Napa Cabernet 2007 | Wine Splash! Living north of the 40th parallel, these winters just howl for a big, hearty red wine! A wine that will thicken your blood and make you feel just that much warmer. There are many to choose from but today I came across the 2007 BV Napa Cabernet Sauvignon in my cellar. This has been a long winter and the only thing that would have been better about this wine was having a larger bottle. In my glass, this wine was a deep ruby red. A prominent nose of blackberries, plums, anise, herbs, and even a hint of petrol. Full bodied over the palate with big tannins but with a silky feel. Robust flavors of black raspberries, ripe black plums, rich mocha, and a bit of herb. On the second taste, more juicy dark fruit, toasty vanilla oak, and a long, lush finish. 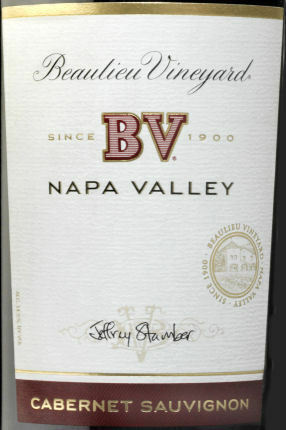 I really enjoyed the 2007 BV Napa Cabernet and give it 91 points. Very complex, yet approachable. A great marriage of ripe fruit and integrated oak make this an excellent food wine! I would pair this wine with pork tenderloin, medium to sharp cheeses, pasta with a tomato meat sauce, or an herb roasted chicken. If you have a 2007 vintage of this wine, I feel it is close to its peak but should hold through 2016. WineSplashing! !